On the road to Cambria, the drive along California’s coastal Highway 1 pulls me into the ebb and flow of the waves. Normally a driver with sweaty palms and hunched shoulders, I breathe into the turns along the shore and can’t resist stopping for photos of the etched cliffs and arching tide. In my mid-forties with two teenagers, I sigh to realize I’ve never taken a weekend away alone. I travelled by myself in college during a semester abroad; my husband and I have snuck away on vacations without the offspring; and I’ve even taken several girls’ weekends away since the kids were born. But right now, frayed at the edges from the push and pull of career and family life, the historic town of Cambria—which rests along Highway 1, 106 miles south of Monterey and 222 miles north of Los Angeles—offers just the right balance of food for the spirit. 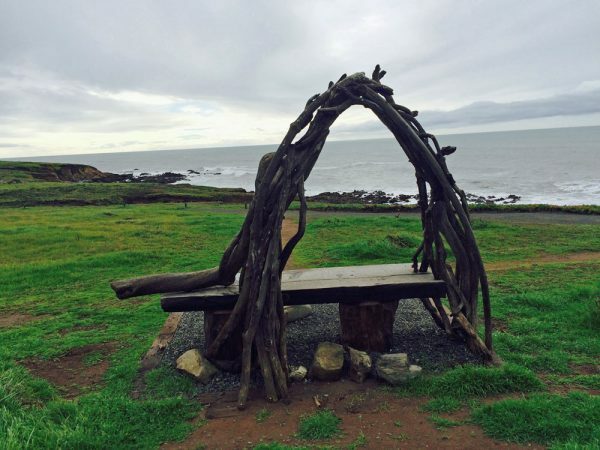 This idea of give-and-take provides a perfect mantra for my weekend; an abundance of educational events and stewardship programs run in Cambria and along the California Highway 1 Discovery Route until the end of February. Visitors have opportunities to plant trees, learn to protect local wildlife and vegetation, and clean up area parks and beaches. At the fine gift shop and tasting room Wine: Taste, Linda Finley, a stewardship ambassador for the town, says, “When people ask me where I work, I tell them I work right here.” She and her co-workers laugh while pouring me a tasting of red wines from the area—as if spending the day sipping wine and talking to people is a ridiculous notion of work. But as she directs me to the museum on my way out and asks me where I’m having dinner, this two-term past president of the Cambria Sunrise Rotary and Cambria Tourism Board outreach chair secretary, demonstrates her commitment to the cycle of giving and receiving within her community. You can’t talk to anyone in Cambria who doesn’t mention Linn’s Restaurant, described as the heart of the town. Aaron Linn, general manager of Linn’s, provides another example of Cambria’s balance of give and take. He speaks proudly of the hard work it takes to maintain the giant greenhouse, from which the restaurant serves homegrown, organic vegetables whenever possible. As a vegetarian who’s also gluten-free, I appreciate the restaurant’s efforts to serve fresh produce and spoil myself with bread and muffins from the restaurant and the bakery. “My parents brought us to Cambria to raise us out of the city,” Linn tells me over a cup of coffee. After his parents opened the business, and then rebuilt after a fire destroyed the original restaurant in 2006, he’s the remaining sibling in town to take control of the business. As he talks about his work, I can hear the sense of responsibility balanced with his joy of raising his own family where he grew up. Friends of all ages squeeze his arm affectionately as they pass by. I don’t know where else I’ve been with that same combination of a cozy café up front, where locals hang out and share news over a cup of Joe, and casual fine dining in the rear. Stepping away from the beach and the town for a bit of privacy, I take a room for the weekend at Cambria Pines Lodge. 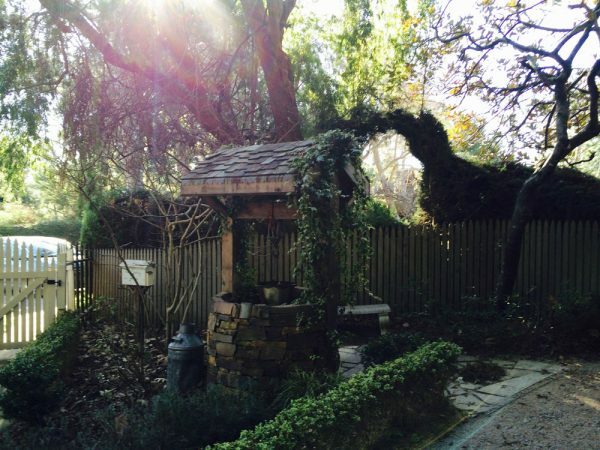 The gate behind my suite opens to a sculpture garden with a well, and woods and shrubbery form canopies along the paths. On the grounds of the Lodge, at the Soujourn Healing Arts Spa, I indulge in a soothing massage with hot stones, and a facial—including deep tissue work where my therapist released the leftover tension in my neck. Each morning, I settle into the country farm kitchen décor with my book, a cup of coffee, and the breakfast buffet at the Lodge Restaurant. I pick tables with a garden view, whether sun specked the leaves or rain turned them into fountains. One night I sneak into the adjacent Fireside Lounge, for the nightly entertainment—on Saturday, it’s a blues country band. On a cozy, corner couch, an older gentleman in a cowboy hat and a couple I’d already run into at the spa scoot to make room for me, and I tap my boots and admire the reverb of the electric guitar, while locals and tourists spin across the intimate dance floor. In San Simeon, I watch a free documentary at the IMAX theater at the Hearst Castle Visitor’s Center, Pelican Dreams. The film takes you on a journey about rescuing and releasing injured pelicans. When narrator and filmaker Judy Irving speaks about her childhood dreams of flight and how the birds stir that longing for freedom, I recall my own flying dreams—where I could soar with the world underneath me, and I never wanted to wake up. Meandering the six-mile loop of the Fiscanlini Ranch Preserve, I pull up my hood against the ocean winds on the pristine grounds. The trail from the beach up to the edge of the pines is lined with curious benches out of driftwood created by local artists, some even with curved backs that beckon you to lean against them, looking towards the sea. Constructed of pavement and packed sand, the trail provides a good surface for walking or running. During one brief visit to the Piedras Blancas Rookery, I witness the Northern elephant seals breeding, hundreds of nursing pups, a birthday, and fierce fights for territory where these enormous creatures take over the beach. Pups must gain nine pounds a day; this depletes the mother seals of one-third of their body weight before they can return to the sea to to eat again and replenish their own stores. Then, the youth are left to learn to fish along the shores. I look at these mother seals and wonder if they share the sense of entrapment I did when I was nursing. They are pinned to the ground by multiple pups of significant size climbing over them, being literally sucked dry of their own life forces. The first time I took to the sea after childbirth—snorkeling on vacation with my then-toddlers—was a milestone in freedom that still sends shivers down my arms. I hope those mother seals experience a tiny piece of that delight as they dive into the ocean again. For awhile, Docent Wayne Attoe tells me, hunters harvesting oil took the number of these seals down to 105 in the entire world. The Mexican and United States governments passed protection laws, and the animals naturally migrated and repopulated until now there are 23,000 who live on Piedras Blancas Rookery alone—the largest home anywhere to the Northern elephant seal. Looking around, the seals seemed to have everything they need now. So I when ask Attoe what they do with donations raised by the Friends of the Elephant Seal, he says, “The thing we’re most proud of is that we fund school groups to come here, those who can’t afford to bus students here—from Southern California” and other areas. In Cambria, the locals’ sense of pleasure derived from giving is infectious, as I soak up the sights and spoils of their efforts. 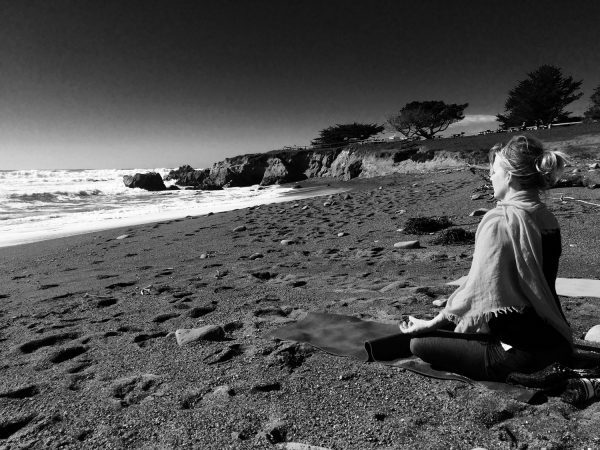 A visit to Cambria pulls you into in this cycle of kindness. Even on the drive home I take the long way—along Highway 1—curling gently into the turns and reminding myself to breathe into the pace of the waves, as I hope to return to life at a permanently slower, more gracious pace. Cambria is filled with farm-to-table organic restaurants with plenty of options for vegetarian and gluten free diners. Cozy restaurants along Main Street offer creative choices for lunch. The Black Cat Bistro, along with a large local wine list and friendly staff. Indigo Moon offers fresh cheeses, fish, and pomegranate mimosas. The outdoor, glass patio from Moonstone Beach Bar and Grill provides the perfect shelter from the wind to take in the vista of crashing waves of Moonstone beachfront. Purchase a guide of the historic walking tour at the Cambria Historical Museum downtown in the East Village to see a nearly century-old saloon, Victorians and other homes dating back as far as the 1870s. The town is brimming of galleries with local artists, shops with local jewelry, and local wine-tasting. Just north of Cambria, the annual Paso Blendfest on the Coast offers local wine-tasting while gazing at the ocean views of San Simeon through Feb. 20. Amy McElroy’s trip was sponsored by highway1discoveryroute.com.